This suffix list is a continuation of the Alphabetical List of Suffixes. It's arranged to make it easier to find the information you want with less scrolling. That page has one list with every kind of suffix mixed together. On this suffix list (made up of several shorter lists), you can find the word endings with similar uses grouped together so they are easier to learn. It starts with the Noun-Building Suffix List: endings that identify a word as a noun and can be added to a verb or an adjective to make a noun. Below the two noun groups are Adjective-Building Suffixes, Adverb-Building Suffixes, and Verb-Building Suffixes. Then there are Suffixes to Show Plurals and Tenses (-s and -es, -ed, -ing, and -en, first an explanation, then the suffixes listed in alphabetical order), and Suffixes for Comparison, as well as a short explanation on how to use suffixes to help identify the meaning of new words. These are suffixes that mean 'the condition of ---', 'the result of ---', etc. Note that the endings in #2 & 6 are usually attached to verbs, to make them into nouns. Suffixes in #1, 4 & 7 are usually added to adjectives (for #1 ‘-nce’ or ‘-ncy’ replaces the ‘t’ of the adjective.) #3 & 8 are usually added to other nouns. 1. –ance, -ancy, -ence, -ency: assistance, attendance, consistency, deficiency, dominance, endurance, evidence, expectancy, negligence, precedence, relevance, tolerance, urgency, etc. 3. –ism (a system of belief): capitalism, communism, federalism, nationalism, patriotism, etc. 4. –ity: adaptability, community, diversity, maturity, predictability, stability, etc. 5. -logy (study of): archeology, biology, cardiology, psychology, etc. 6. –ment: achievement, attainment, commitment, postponement, requirement, etc. 7. –ness: carelessness, fearlessness, friendliness, sleepiness, sweetness, etc. 8. –ship: authorship, citizenship, friendship, relationship, scholarship, etc. 1. -an, -ian (a person belonging to a country or group; many of these can also be used as adjectives): American,Christian, civilian, Indian, Korean, physician, etc. 3. –ee (a person who receives the action-- is deported, employed, etc. ): deportee, employee, nominee, referee, refugee, trustee, etc. 4. –er, -ar, -or (a person who does something; often used for occupations): banker, beggar, employer, exhibitor, killer, liar, organizer, painter, survivor, etc. 5. –ist (a person belonging to a group with similar beliefs or skills): biologist, chemist, communist, guitarist, machinist, nationalist, organist, physicist, etc. 1. –able, -ible (able)* -- (negatives/antonyms in parentheses): (in)accessible, (un)adaptable, (un)bearable, (in)flexible, (dis)honorable, (ir)reversible, (un)sustainable, (in)tolerable, etc. *The BBC has some suggestions for when to use -ible instead of -able, which is much more common. 2. -al (related to; pertaining to): biological, environmental, natural, supplemental, technical, visual, etc. 3. -ant (being ___): relevant, reluctant, significant, tolerant, etc. 4. -ary (belonging or related to): discretionary, diversionary, military, supplementary, voluntary, etc. 5. -ed (from a verb's past participle, often describing a feeling or condition): annoyed, complicated, surprised, united, etc. 6. -en (from the irregular past participle of a verb): broken, fallen, hidden, etc. 7. -ent: consistent, evident, negligent, proficient, sufficient, urgent, etc. 8. –ful (full of): careful, doubtful, fearful, helpful, grateful, tactful, etc. 9. –ic (nature of, like): acidic, domestic, emphatic, geologic, metallic, patriotic, realistic, symbolic, sympathetic, etc. 10. -ing (from a verb's present participle, often describing what causes a condition or feeling): annoying, inspiring, surprising, tiring. 11. –ish (similar to, belonging to): girlish, childish, reddish, Scottish, etc. 12. –ive (related to; makes a verb into an adjective): abusive, conclusive, exclusive, ineffective, supportive, etc. 14. –ous (having, full of): courageous, erroneous, malicious, nervous, obvious, serious, etc. 1. –ly (in the manner of): carefully, carelessly, conversely, effortlessly, logically, realistically, strategically, willingly, etc. 1. –ate: to allocate, disintegrate, eliminate, incorporate, estimate, manipulate, terminate, etc. 2. -en (to make-- from Old English): to blacken ('to make black' or at least blacker), deaden, deepen, fatten, frighten, heighten, redden, whiten. 3. –fy (to make): to amplify, beautify, clarify, fortify, unify, verify, etc. 4. –ize (to make): to familiarize (to make something familiar to someone), immobilize, liberalize, memorize, organize, penalize, realize, etc. We add '–s' (or sometimes '–es') after most nouns for plurals (more than one). We use ‘-es’ to make it easier to hear the plural ending after words ending in ‘s’ or similar sounds: ‘x’, ‘ch’, or ‘sh’ (as well as some words ending with ‘o’ and all with consonant + ‘y’ -- which changes to ‘i.’) So we say one brush but two brushes; one box or two (or more) boxes; two brushes, several churches, three babies, a bag of potatoes or a serving of fries. In English adjectives do not change for singular or plural. Present tense verbs do change form, but in a way opposite to nouns. Only the 3rd person singular (he, she, or it) adds an ‘-s’ (or ‘-es’ for the sounds above) to the base form of the verb. Other verb tenses do not change form based on singular or plural, but some do add a suffix to show the tense. The regular past tense ending is ‘–ed’ (or just –d if the verb ends in ‘e’), but there are many irregulars. The suffix ‘-ing’ makes the present participle, used to form continuous tenses for verbs (I’m going to the store; he is listening to music; the babies were crying for hours) and for certain adjectives. 1. -ed for past tense or a past participle for regular verbs: designed, identified, reacted, talked, etc. 2. -en for some irregular past participles: eaten, forgotten, written, etc. 3. -ing for present participles: doing, sleeping, etc. 4A. –es for plural (2 or more) nouns with the base endings mentioned above: 2 dresses, a set of glasses, a family of foxes, suffixes, mustaches, tomatoes, cookies. 4B. -es for 3rd person singular of present tense verbs with those endings: He brushes his teeth. The baby cries a lot unless her mother carries her. Tom goes to an art class every Saturday. Does Joe go too? 5A. –s for 3rd person singular present for most verbs: Mary reads a lot of books and magazines. Joe listens to tapes. He likes to listen to science programs. 1. –er (added to adjectives, this shows that something has more of that quality than something else does): It’s bigger, smaller, faster, slower, noisier, quieter. 2. –est (added to adjectives to show that this one has the most of some quality compared to any others): Jim is the biggest student in his class and Sally is the smallest, but Sally is the noisiest of them all. If you know that ‘revolve’ means to turn over (the way a wheel turns), you might be able to guess (especially from the way the word is used) that a revolution is a complete turning over or major change. To revolutionize is to cause that major change. If you know that strategies are well-thought out plans to achieve long-term goals, you can infer that strategic thinking is focused, long-term planning and that ‘to strategize’ means to make such plans. If you know the meaning of beautiful (full of beauty), you can guess that ‘to beautify’ is to make something beautiful. If you read about a city’s ‘beautification campaign,’ you can infer that citizens or planners want to clean up their city and make it more attractive. 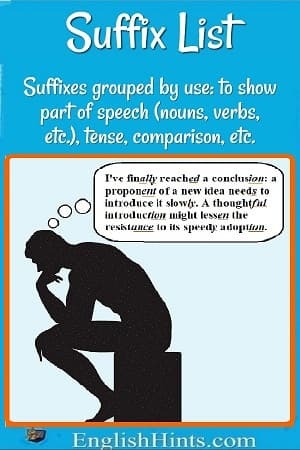 Be sure to check out Word Families for an explanation of how roots, prefixes, and suffixes work together, as well as the parts of speech formed by different suffixes. See Practice Suffixes, Word Formation Examples & Exercises, and Word Family Practice for more of these explanations and to practice more suffix meanings and uses. Networking Vocabulary Games and Teamwork and Cooperation Vocabulary have category games to practice noun, adjective, and verb suffixes.